Great for can disposal, this recycling lid ensures only the recyclables desired are disposed of within the can. Direct from Rubbermaid, this recycling lid fits Rubbermaid's recycling cans with ease, making it a great fit for both commercial and residential environments. This durable recycling lid is comprised of an all-plastic, professional-grade formula that will not rust, chip or peel, and it resists dents. 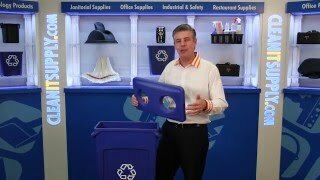 Hygienic tops for attractive, hands-free waste disposal. Easy access for trash disposal. Two round opening for bottles and cans. 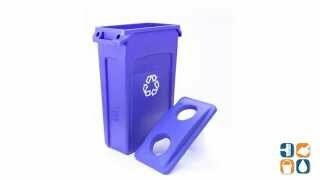 Fits 16 and 23-gallon Slim Jim Recycling containers (RCP 3540 & RCP 3541), sold separately.